In case you missed it, the 2019 Jeep Wrangler is pretty impressive. This SUV is so impressive that MotorTrend has named it the SUV of the Year. There are many reasons behind the award being given to the Wrangler, but honestly, this isn’t a surprising decision for anyone. The Wrangler, even with the iconic grille, has continued to evolve into a groundbreaking vehicle that gives you a soul-stirring affirmation of freedom. Every time you get into a Wrangler, it is almost as if the SUV talks to you. This SUV is proof that the legacy of a vehicle, and the future technology of it, can coexist perfectly. Even with all of the redesigned and re-engineering, the Wrangler never forgets where it comes from. Instead, those changes only continue to make this SUV more and more special. Interested in learning more about why MotorTrend chose the 2019 Jeep Wrangler? Keep reading down below! What engineering perks come with the 2019 Wrangler? The engineering excellence in the 2019 Wrangler is what truly sets apart this SUV. Off-roading is simply what the Wrangler is known for, and in the 2019 model year, off-roading is truly what makes the Wrangler shine. The off-roading capabilities that you’ve come to know have only been enhanced, with improved articulation and improved suspension travel on the Rubicon. 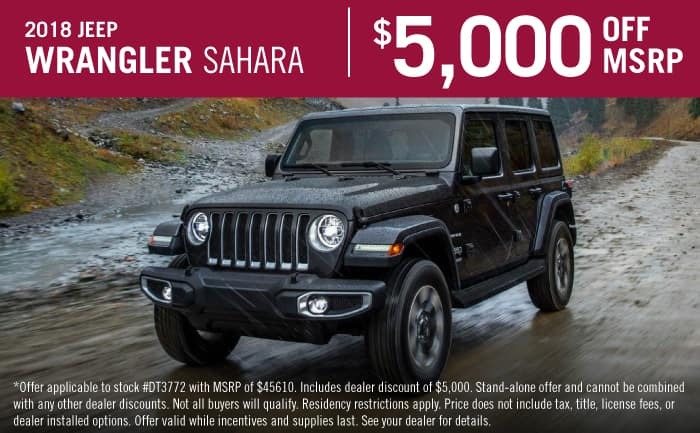 The Sahara model alone comes with full-time four-wheel drive, and even Dana 44 front and rear axles that feature disconnecting anti-roll bars and electronically locking differentials. MotorTrend themselves has stated that the Jeep is truly special because it can be configured to suit people with off-roading needs that are both amateur and expert. The experience either way is rewarding. To round it all off, the 2019 model comes with a new 2.0-liter eTorque turbo-four mild-hybrid powertrain. This powertrain can get you up to 270 horsepower and 295 pound-feet of torque. Not only is this an impressive engine for the Wrangler, but it would be impressive no matter what vehicle it was paired with. We’d also be remiss to not mention the 3.6-liter V6 engine, which pumps out 285 horsepower. The standard transmission is a six-speed manual for the V6, while an eight-speed automatic is optional. What kind of safety does this SUV offer? The Wrangler rolls into 2019 with the latest in safety. To start, the Wrangler has amazing maneuverability, which is always a good place to start. Moving forward, the frame is high-strength steel, and every single Wrangler comes standard with seat-mounted front side airbags. A few available safety features include LED headlights, rear cross-traffic alert, and blind-spot monitoring. You might also get the option to add forward collision warning, which is most definitely a bonus for anyone looking to keep their Jeep and their passengers safe and sound. 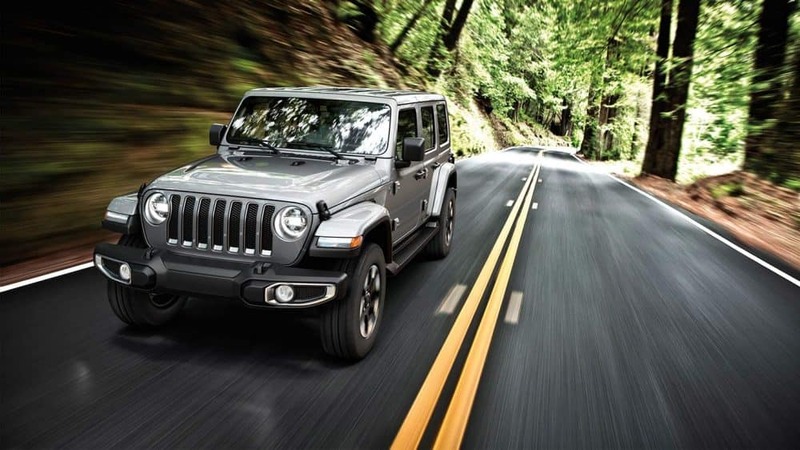 The reality is, if you are looking for an SUV that will keep you and your passengers safe, the 2019 Jeep Wrangler has your back. What design features make the Wrangler stand out from the competition? Just one glance at the 2019 Wrangler and you’ll understand everything that this SUV has to offer. Not only are you getting the iconic look that grabs everyone, but you’re also getting the latest in technology that will make go you crazy. The always popular canvas top and plastic side windows are still available, along with a fold-down front windshield. You can customize further with things like a body-colored hardtop or a black hardtop. Anyone that knows Wranglers can immediately understand what to expect with the interior, and the soft-touch and high-quality materials are standard, especially among competitors. Even on the technology side of things, you’ll be getting the Uconnect infotainment system, with a few different screen sizes, and Android Auto and Apple CarPlay are also available. The truth is, the Wrangler just has it all, and the legendary styling just seals the deal. If you want to get into this award-winning SUV, then you need to check out our new Jeep Wrangler inventory! The Wrangler is truly a vehicle that can do it all, and MotorTrend recognizes that utility. Stop by our dealership today!